If you are involved in retail development in emerging markets, did you know you should be thinking about … Rwanda? A recent report highlights important news from Africa: burgeoning (and unexpected) opportunities for the retail sector as the continent’s growth takes off. Another spotlights an important problem holding Africa back: the continuing gender gap confronting women in African agriculture. These stories matter to business people, development specialists, and anyone else concerned with the continent’s future. Massive growth opportunities exist in Africa’s retail sector, a report from consulting firm AT Kearney, “Seizing Africa’s Retail Opportunities,” has found. The numbers are impressive: a market of 900 million people, smaller only than that of India and China, urbanizing at 3.6% per annum, the fastest rate in the world. GDP growth averages 6% per year across sub-Saharan Africa and seven of the world’s ten fastest-growing economies are there. A growing middle class exists, atop an urban working class that is low in income but fast-expanding in numbers. The greatest opportunities are in grocery retail and health care, necessities for poor and better-off Africans alike. Informal retail still dominates 90% of African commerce, with formal retail limited to the urban areas. As Africans move to towns and cities, there is huge room for formal retail to expand. 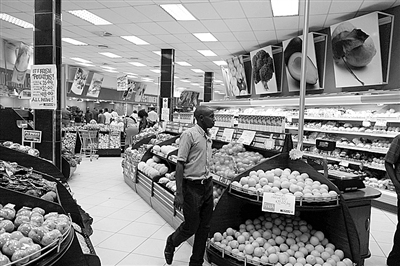 The report says some international retailers have already noted the opportunities and are moving in, including South Africa’s Shoprite, active in 16 African countries, Nakumatt, based in Kenya but active throughout east Africa, France’s Carrefour, moving into former French West African colonies, and Wal-mart, which plans 90 supermarkets across Africa over the next three years. 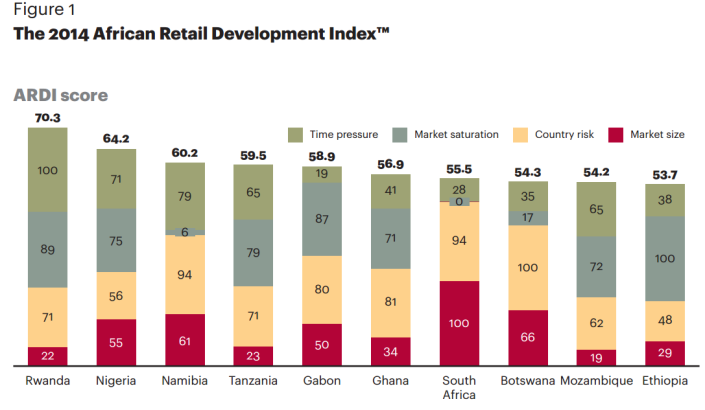 The most attractive countries for retailers include the continent’s two largest economies — South Africa and Nigeria — and Ethiopia, its second most-populous (after Nigeria), according to Kearney’s Retail Development Index (See Figure 1). There are also three countries in South Africa’s hinterland (Namibia, Mozambique, and Botswana), Tanzania in East Africa, oil-rich Gabon in Central Africa, and fast-growing Ghana in West Africa. The biggest surprise: the No.1 candidate, little Rwanda. This east African country has recovered from the 1994 genocide to record one of Africa’s highest growth rates. Rwanda and the other high-retail-potential countries were chosen on the basis of a mix of competitive time pressure, market saturation, country risk, and market size, brought together in the Kearney Index. Of course, one important point about the Kearney study: it’s not based on a survey of African consumers themselves, but on macro-statistics on the African countries from the World Bank and other sources. To get a sense of what African consumers want — and can afford — to buy, there’s no substitute for real, on-the-ground market research in African countries! At the other end of the scale, a report from the World Bank and the ONE campaign reveals the substantial problems facing Africa’s poorest consumers — and producers: women farmers. It’s titled “Levelling the Field: Improving Opportunities for Women Farmers in Africa.” These researchers got their hands dirty — working on commissioned quantitative surveys out in the field — literally! — by the national statistical offices of Nigeria, Ethiopia, Tanzania, Uganda, Malawi, and Niger. The total sample included 46,837 farm managers across the six countries, of whom 31%, or 14,330, were female. Though the study included three of the countries listed as hot retail prospects in the Kearney report – Nigeria, Ethiopia, and Tanzania — its focus is the people least likely to enter their new malls and retail outlets – female farmers. Output statistics highlight big gender gaps in agricultural productivity by country. Even after accounting for gender differences in plot size and regions, women farmers produce from 17% to 33% less than men in southern Nigeria, Tanzania, Ethiopia, Malawi, and Uganda. The gap is 46% in northern Nigeria and a stunning 66% in Niger. Labor supply: Women farmers tend to have smaller families and thus less family labor for their farms, because they are often widows, migrants, divorcees, or single mothers. It’s also harder for them to use outside labor, either because they can’t pay as much as men, men work harder for men, or they have less time than men to supervise laborers because of child care and other family responsibilities. Fertilizer and seeds: Returns are lower on fertilizer for women, either due to lower-quality fertilizer or poor use or timing. Obtaining and paying for high-quality seeds is also a greater problem for them. Land tenure systems: Lower output for women may reflect that the land they use is lower quality or that they have difficulty managing it or investing in it due to insecure land tenure. Agricultural extension: Women farmers are less likely to attend extension training due to household responsibilities and cultural restrictions on their mobility or interactions with male trainers. Education: Lower educational attainment and literacy among women also seems directly related to lower productivity in some of the countries studies. 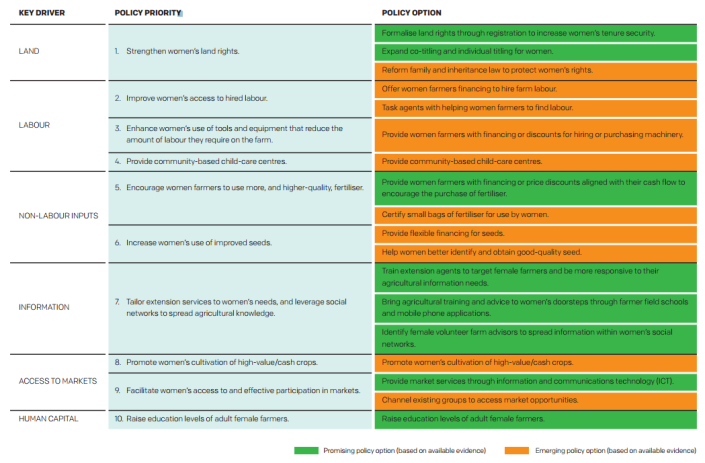 Market access and crop choice: Women were less likely than men to produce higher-priced export crops, focusing more on subsistence production and less on commercial farming. The authors recognize that the mix of problems facing women varies from country to country. Their work also shows that more field research is needed to identify which of the potential barriers actually inhibits women’s productivity in the circumstances of each. Still, they identify an ambitious agenda for African governments and foreign donors to consider to address these issues, shown in the table below.